Unforgettable vacation on a tight budget is possible. Sometimes a trip can be a solid cost especially if you are travelling in a package of four. 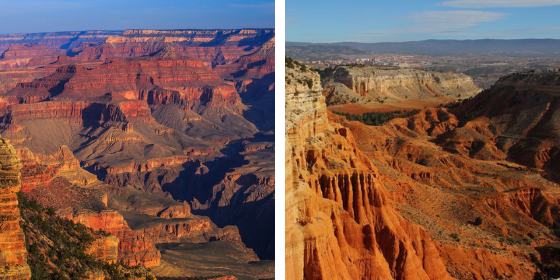 There are some famous landscapes that everyone have put on their bucket list. However, you will be surprised that some places are much closer than you might think. It is not necessary to go to the Amazon to see in person the exotic place. Take note of our selected cheap holidays without the need of travelling miles! They are just as beautiful as the ones in Provence! 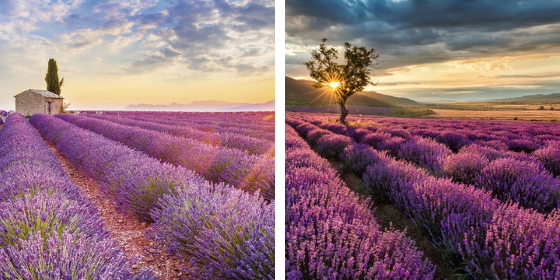 In Brihuega, the Lavanda Festival is celebrated on the 14th of July, although the fields can be visited from the beginning of the month. As July comes to its end, the purple color becomes more intense. The festival is held in the middle of the field and the dress code for the ones who will attend is white. It’s something very beautiful that deserves to be experienced. There are two large fields and the entrance fee is 2 euros. Our advice is to enjoy the sunset and leave the (thousands) of pollinating bees to do their job. 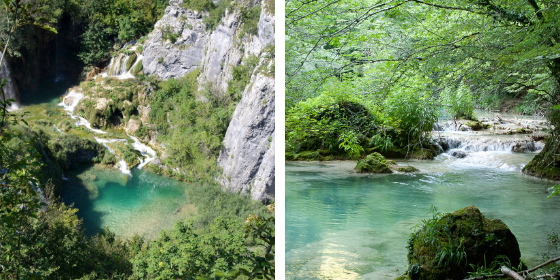 The famous and beautiful lakes of Plitvice, in Croatia, are very similar to the Urederra river, in Navarre. It was declared a Natural Reserve in 1987. Its crystal blue waters that flow through, reflect the sun’s rays and the leaves of the trees. Truly unmissable view! Are you convinced now that you can enjoy cheap holidays even if they aren’t too far away? At 30 kilometers away from Barcelona, specifically in Torrellas de Llobregat , are situated the Can Riera Caves. 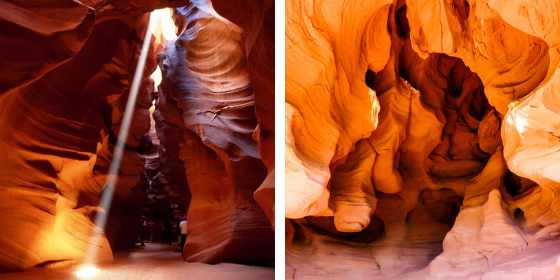 They are clay-colored with red-orange cavities reminiscent of the famous Antelope Canyon in Arizona. Go on a sunny day because that’s when they reveal their real charm. 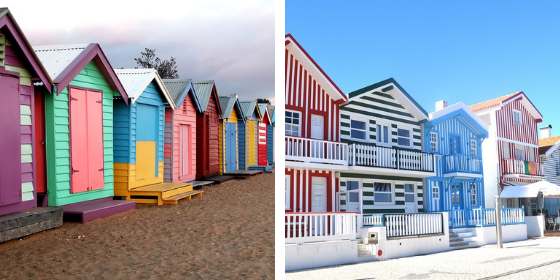 The famous colorful houses of Brighton Beach (in Melbourne, Australia) have twins on the Costa Nova de Aveiro, Portugal. These constructions were originally warehouses for the local fishermen to keep their materials. With the passage of time, they were rebuilt in order to turn them into summer houses. In the 1960s, there were around 200 residents living in the town. In this decade the construction of the Lanuza reservoir was announced to regulate the Gállego river, so the town had to be flooded. By 1978, Lanuza had become a ghost town. A few years later, the old neighbors (who lived in the nearby municipalities) realized that the old town isn’t under the water anymore. Thus, they’d decided to give it a second chance. In the 90s, after a legal battle, the old inhabitants could buy the houses and lands that were habitable. Today there are already 32 refurbished buildings and 68 homes, as well as public spaces such as parks, libraries and restaurants. All this with the money of the neighbors, who have not received any subsidy. 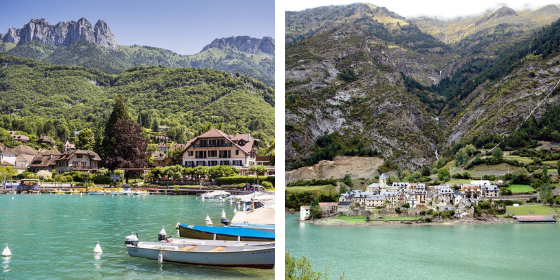 But let’s go back to the topic: this town reminds us a lot of the villages that are on the shore of Lake Annecy, like the one in the picture, called Talloires-Montmin. Masca is situated in the Parque Rural del Teno, in Tenerife. On the top of a hill, you will see the huge solid rock that is its symbol. The destination is perfect for hiking lovers, as you go up, the views get even more beautiful. 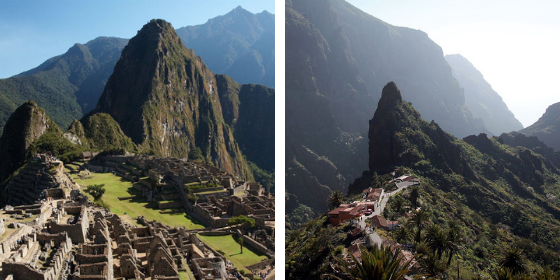 Don’t tell us that it doesn’t remind you of the Machu Picchu mountain! The Red Canyon of Teruel, which is also known as the Rambla de Barrachina, has a striking resemblance to the Grand Canyon of Colorado. It is a little more than 10 minutes car journey from the center of Teruel, and it is a very popular place among hikers thanks to its unique landscape. These are our ideas of destinations and places for amazing but cheap holidays. We would love to expand the list, so if you know some other places, please do tell us! If you are looking for more ideas for your next getaway, check out our family travel recommendations this year.